For the past few decades, there have been efforts by the State to preserve and protect the historic area, limiting construction, acquiring private property. We’ve been wanting to take this trek for over a year. Missed it last December, and summer was too hot, so now that fall is here we took advantage of the Italian holiday (All Saints’ Day) on November 1 and ventured out. I gave my “new” legs about an 8km (5 mile) test, the longest walk I had since prior to surgery. It felt great! 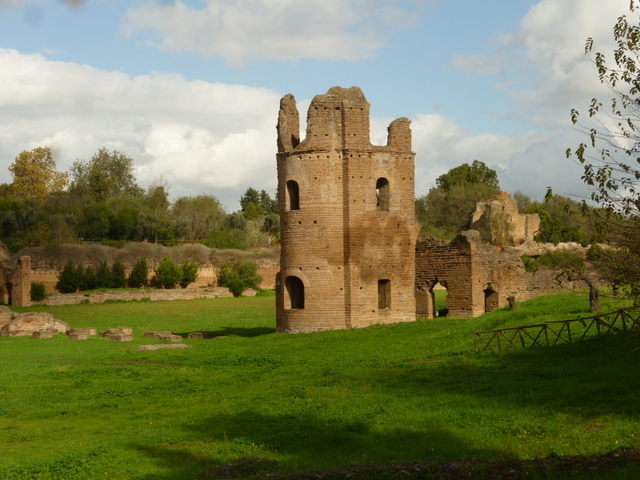 It is difficult to believe this is so close to Rome: just a quick Metro + bus ride away. Not much of a narrative this time, just some pictures to share. 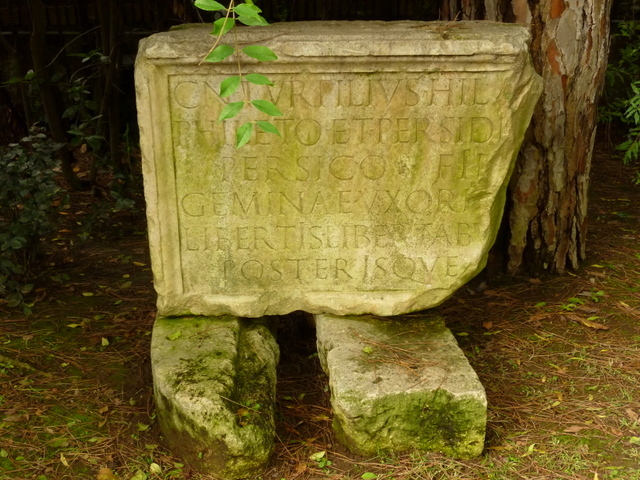 Ruins of a famous villa and “circus” or chariot race track. 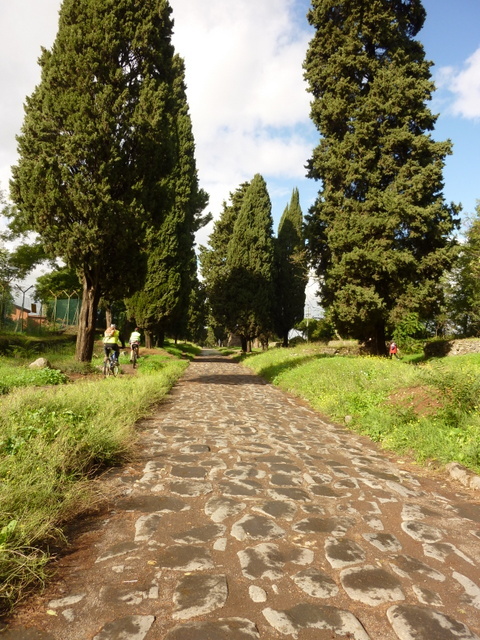 Very peaceful stretch of the Via Appia Antica. That’s Ric meandering in the distance. 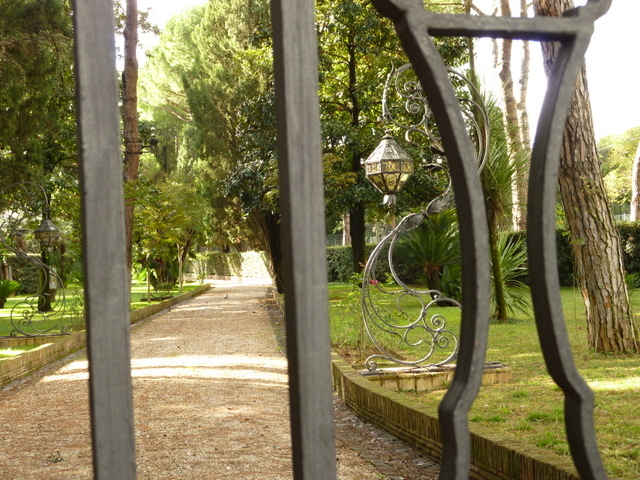 A peek through the gates at a private estate. We encountered many cyclists during our walk. 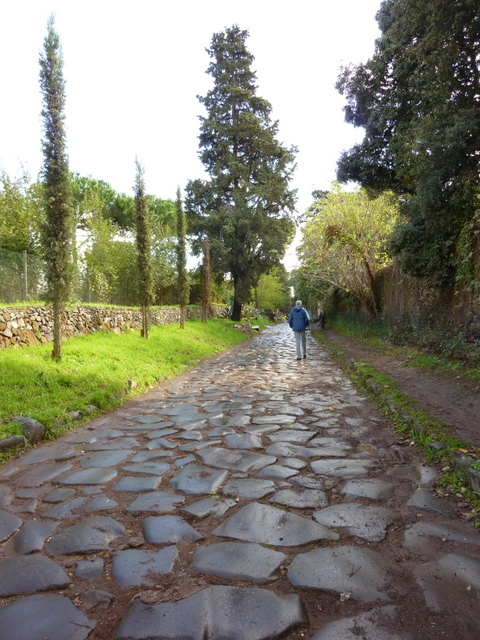 We think the ancient stones would be a tough ride, but there are some dirt paths alongside the road. 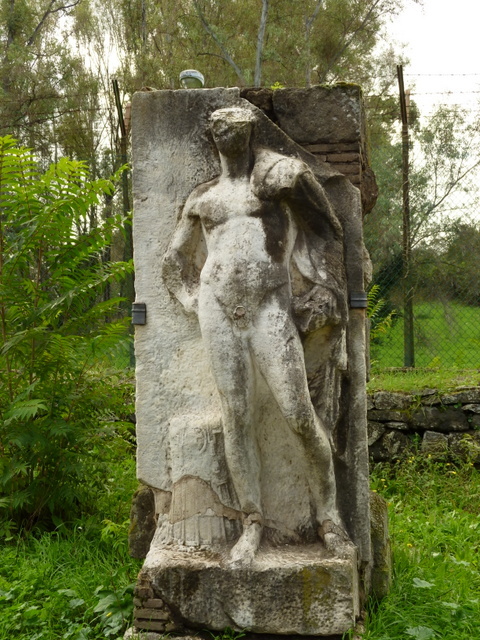 Along the road one sees many artifacts such as this statue. Tombs once lined the ancient road. 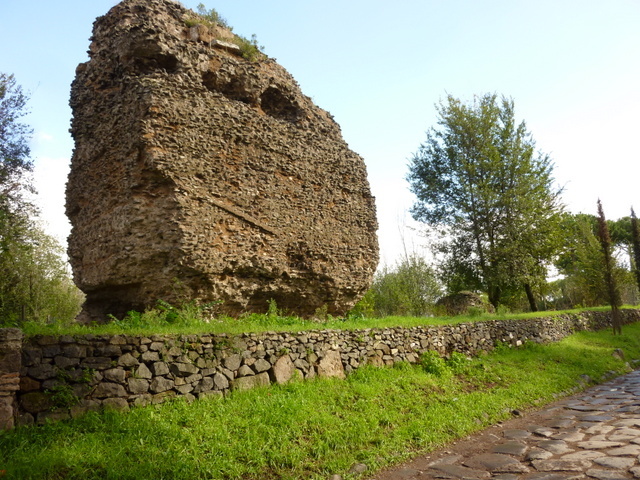 There are some intact crypts to visit, and many crumbling structures such as this one. Glad to hear your legs are healed and are leading you on new adventures! Love the pics. Love the walk. Love the posts. 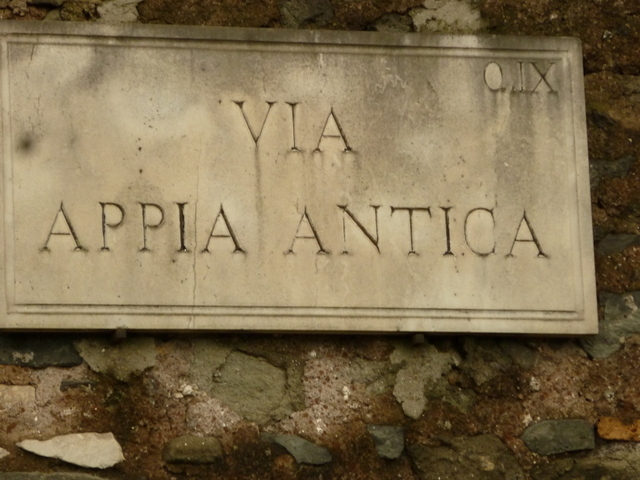 Perhaps we could do this walk when we visit in 2013?? I know Barbie was interested. Alas, I only had 3 days in Rome when I visited Italy so I know there are a lot of things I missed! I just voted and took my aunts (89 & 95) to vote as well. We are still cleaning up from the storm here in NJ. It was very bad and we are estimating another 6-8 months at least. They are still not allowing island residents back…only emergency vehicles and clean-up trucks. Luckily, my house did not lose power although the next street was out for a week and there are still over 1 million without power. I helped to collect toiletries, water and non-perishable food last Sunday at my church. Everyone is very generous and trying to do whatever is needed! Cara, How fortunate you are to have your home intact, with power, and your dear aunts safe. Thank God! I cannot imagine the aftermath of such a storm! Stay safe and we’ll see who else decides to come visit! Election day is FINALLY here. I’m so ready to move on! Altho, moving on probably doesn’t mean an end to all the bickering that is so annoying to me. I enjoyed these pictures so much. And the captions to know what I was looking at. Looked like you had a beautiful day for this walk. Yikes is right about the holidays being on top of us. I’m looking forward to spending Thanksgiving at Linda and Paula’s (McCall). Hope you are set with what you are going to do to celebrate the day. Hi Carolyn! I am off to an Embassy event to watch the first returns come in tonight. Should be interesting to share this with our Italian friends. Ciao! Ciao Cara! Glad you are safe. At least Portland doesn’t have hurricanes! We had Portland weather here Sunday. I really wanted a place to go for an omelet and hashbrowns, like Kenny and Zuke’s or the Stepping Stone. Guess I’d better cook one myself. SIGH. Can you believe we are talking about “the holidays?” Yikes! Glad your new legs are working and you are back to walking again. Hi Di! I never really stopped walking, but it’s so much better now! So happy to hear you are doing well. It’s one day before the election and I will be so glad when it’s over . As you might remember, the TV ads are constant. In your case do you vote via absent ballot ? Love your posts and keep em coming …. I forward them on to Dan Jossi . Ciao Mary! Yes, we voted by absentee ballot adn are spared much of the endless commercials. We do watch the American news at wor to stay in touch, so we get the constant analysis, not to mention the partisan bickering. I, too, will be glad when it ends!